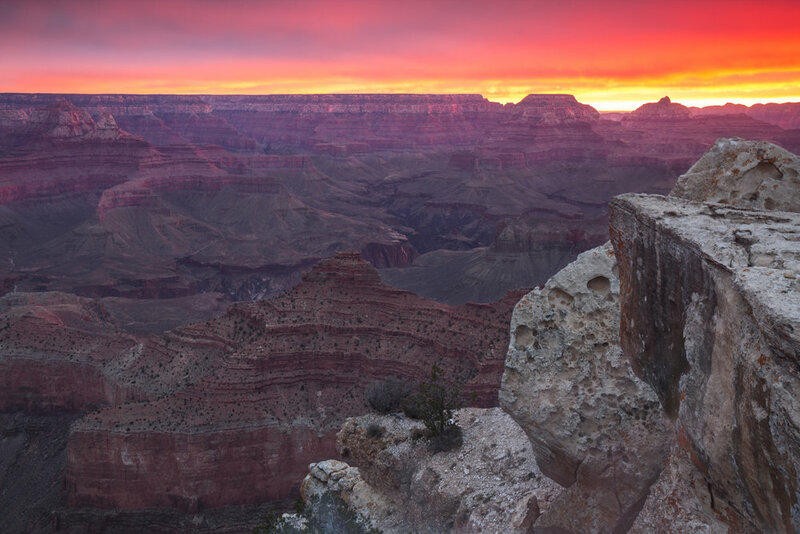 Along with Southern Utah, northern Arizona contains some of the most recognizable natural landscapes of the Colorado Plateau, including the majestic Grand Canyon. To the Canyon’s east lay three other enormous eroded landscapes central to Arizona’s high desert, Monument Valley, Canyon de Chelly, and Coal Mine Canyon. These parks are best know for their beautiful valleys, eroded buttes, canyons, and ancient cliff dwellings. North of the Grand Canyon, near the border with Utah, Arizona features the incredible strange multicolored desert rock landscapes of White Pocket and Cottonwood Cove in South Coyote Buttes. Several highly photogenic slot canyons near Page attract photographers and canyoneering enthusiasts from all over the world, including Antelope, Secret, Rattlesnake Slot Canyons and others. America’s most famous national park and natural formation, the Grand Canyon, of northern Arizona is a staggering 277 miles long, up to 18 miles (29 km) wide, and attains a depth of over a mile (6,093 feet or 1,857 meters). The canyon, which was carved by the Colorado River over the last 70 million years as the Colorado Plateau was uplifted, exposes 40 major sedimentary rock layers, ranging in age from about 200 million to nearly 2 billion years old. Most were deposited by ancient shallow seas that stretched across North America. 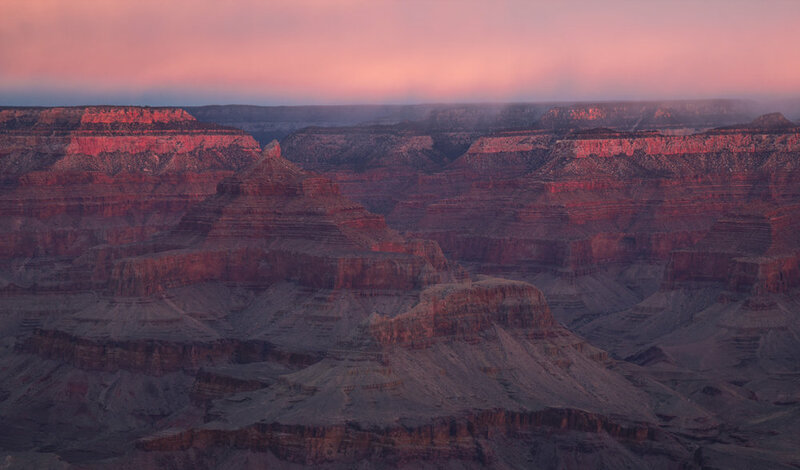 For all its majesty, the canyon’s sheer size makes it difficult to photograph though watching both sunrise and sunset at its edge is always a magical experience. These hidden gems located in the Hopi Reservation of northern Arizona may lack the breadth, depth, and age of the more famous Grand Canyon to the west but Coal Mine Canyon and Ha Ho No Geh Canyon are more colorful, diverse, and hardly visited by tourists. The compositions one can shoot of these twin canyons are endless and the colors, forms, and textures of the eroded sandstone rival that of Monument Valley and Canyon de Chelly to the east. Only a few solitary dirt roads lead to certain sections of these canyons but once there, visitors are free to roam endlessly looking for interesting vistas. Because of their remoteness, the canyons are criminally overlooked but the fact that photographers can shoot either from the west or east makes them perfect for both sunrise and sunset photography. Located 40 miles east of Phoenix in the Sonoran Desert, Lost Dutchman State Park and nearby Tonto National Forest are home to wonderful variety of cacti, shrubs, and other desert plants. The main attraction, however, are the Superstition Mountains, a stunning range rising from flat land. The peaks reach a maximum elevation of 6,266 ft (1,910 m) and prominence of 1,706 ft (520 m). Their height, along with the rich flora at their base allow for quintessential Southwest desert photos. "The Superstitions" also hold local folklore significance as some Apaches believed that the hole leading down from within them enters the lower world, or hell. Today it is thought that the winds blowing from this hole create the severe dust storms metropolitan Phoenix experiences regularly. One of Arizona’s best kept secrets is an incredibly scenic section of the Hopi Reservation’s Moenkopi Wash filled with multicolored rocks and interesting formations. The area can only be legally accessed with a permit from the Hopi Nation and a guide. The rocks there have eroded and broken down into countless smaller pieces and this erosion has opened up small slot canyons and side trails. Most of the rocks in the canyon have splashes of white streaked across them and look like Native American petroglyphs (images created by removing part of a rock surface by incising, picking, carving, or abrading, as a form of rock art). These streaks really draw the eye (and the camera). It’s hard to believe that natural processes create such human-like decorations but such is the beauty of Blue Canyon. The gorge, pictured here, is a section of the Little Colorado River, making up the lower 57.2 miles (92.1 km). There are a number of overlooks off of Highway 64 (Desert View Drive) accessed - for the most part - for free. Saguaro National Park is home to one of the greatest concentration of the Southwest’s most recognizable and iconic plant, the giant saguaro cacti. The plant is closely associated with western films and a symbol of the Southwest in general. Located both east and west of Tucson, the cacti in the national park grow twice as fast as those in western Arizona’s because of the region’s precipitation rates. It’s astonishing how wide and tall they can grow – occasionally over 40 feet (12.2 metres) in height! Sweeping views of saguaro forests are best observed on the Cactus Forest Drive in Saguaro East – Rincon Mountain District and the Scenic Bajada Loop Drive in Saguaro West – Tucson Mountain District. The saguaros silhouette very well during the warm sunsets typical of southern Arizona, especially when the air is a bit hazy and/or clouds are present. Few places are revered by well-traveled Southwest photographers as much as White Pocket in Vermilion Cliffs National Monument. The approach to this location is bumpy, confusing, and very sandy rendering it accessible to only the few and devoted. But the otherworldly formations and colors found here are absolutely mind-blowing. The Southwest is littered with areas that can be considered “alien” but this place takes it to another level. You could spend a week in this small area and continue to find new photographic compositions. Cottonwood Cove is located near White Pocket in the South Coyote Buttes area of Vermilion Cliffs National Monument and similar in look to White Pocket’s rocks, cones, and surreal formations. As a reward for the backcountry navigation and driving skills that it takes to get there, visitors encounter amazing one-of-a-kind desert scenery. I particularly liked the pictured set of rocks that share the same swirls of colors - yellows, oranges, browns, and reds. As its name suggested, Petrified Forest NP preserves a 200 million year-old forest of confer trees that lived in the Late Triassic Period. During this period many trees were downed due to shifting streams and began accumulating in river channels. As they were quickly buried by the sediment, groundwater carried dissolved silica (silicon dioxide) it into the logs, where it formed quartz crystals. These crystals gradually replaced the organic matter forming what we see today. Although the logs are an incredible sight, the park’s badlands are perhaps most extraordinary. The short one-mile Blue Mesa Trail, in particular, weaves around fragile bentonite clay and petrified wood exposing a kaleidoscope of wonderful colors. This trail, and much of the park, is part of the multicolored “Painted Desert” of northeastern Arizona. The small southern sliver of Nevada shares a lot in common with the surreal desert neighbor Arizona to the east. Multicolored rock formations, badlands, and towering mountains surround metropolitan Las Vegas offering desert enthusiasts a range of photographic options. Perhaps the most notable, Valley of Fire State Park, just to the city’s east, features rolling hills of hard rocks colored in psychedelic pastel hues. To the city’s west is the great Red Rock Canyon, a bouldering and climbing paradise of flatland surrounded by towering red sandstone peaks. To the north, lay the badlands of Cathedral Gorge State Park, complete with slot canyons and beautiful cracked earth. Renowned by photographers the world over for its Aztec Sandstone, Valley of Fire State Park, may be one of the most colorful places in the entire southwest. It’s hard to believe the vivid kaleidoscope of colors are real unless they are witnessed first-hand. Swirls of reds, oranges, yellows, browns, and pinks color move from one rock to the next painting a psychedelic scene of intense saturation. There are a few established trails in the park but visitors are free to roam, provided they are careful not to split or break the rocks. My favorite section has to be the Kaolin Wash (picture one), a shallow slot canyon of red and orange rock, filled with pink sand. As both a hiking and climbing destination for the residents of greater Las Vegas, Red Rock Canyon is a very popular recreation area. The canyon is a vast flatland where yucca and other desert plants lives surrounded by some of the tallest mountains in the region, including La Madre Mountain, at 8,154 feet (2,485 m). The rocks themselves are red and orange and acquired their color from iron oxide that built up over centuries. Climbers and boulderers can be found here nearly year-round ascending the vertical peaks. For hikers, numerous smaller canyons and seasonal waterfalls are accessible to those willing to explore the mountains more closely. The area was also home to the native Paiute tribes and numerous petroglyphs, and pottery fragments, remain today throughout the area. Because of its location more than 160 miles north of Las Vegas, Cathedral Gorge is a hidden gem unknown to casual tourists, yet it is an essential part of the Nevada desert landscape. This tiny park protects beautiful badlands that have eroded and contoured into diverse and interesting shapes. Wind, rain, and ice have combined to shape the soft bentonite clay into unique formations in and around the gorge. The most remarkable hikes in the park may be the Miller Point Trail, which provides an elevated view into the gorge and Cathedral Caves, which takes you into the twisting slot canyons within the badlands and provides a relief from the summer heat. Interestingly, the park’s landscape provided a dramatic backdrops for open-air plays and annual Easter ceremonies throughout the 20th century.